There’s nothing quite like slipping inside a hot tub and relaxing after an exhausting day. You can enjoy it on your own, or share the fun with your friends and family. As you probably know, many types of hot tubs are available, based on your preferences and budget. 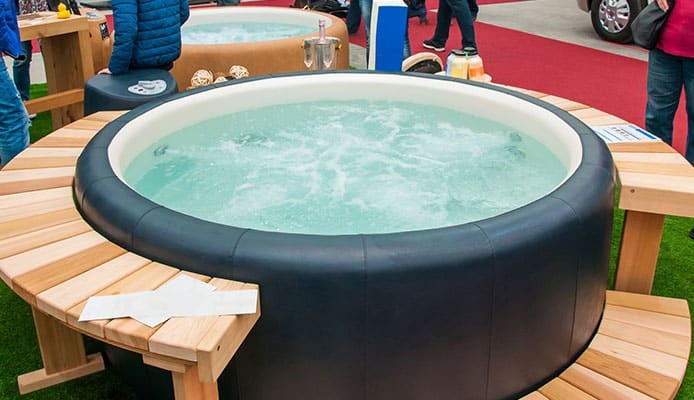 In recent years, inflatable hot tubs have increased in popularity – they provide you with everything you would expect from a hot tub but with a few added benefits such as easy setup, portability, and being much more affordable. When talking about this type of hot tubs, one name stands out above all others – Intex. They are one of the best known manufacturers of all things inflatable, including hot tubs. Their products have top-notch design and functionality, so you can be certain you’re getting your money’s worth. In this article, we will discuss the best Intex hot tubs you can find out there, so you are well prepared when hot tub season comes. 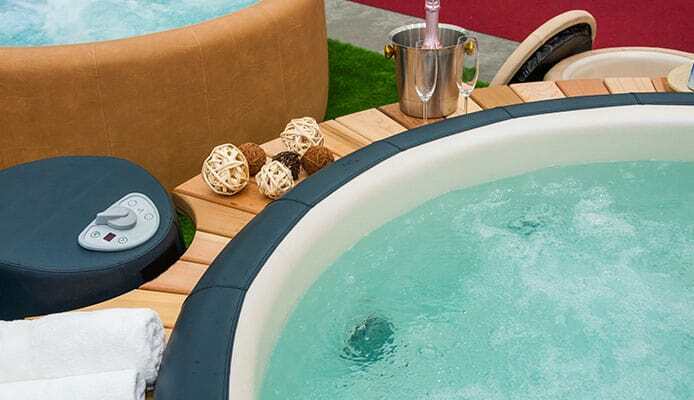 Also, don’t miss out on our buying guide where you can learn more about all the great features implemented in Intex hot tubs, as well as what things need special attention when looking for best inflatable hot tubs. This hot tub is top of the line when it comes to relaxation. It easily accommodates up to six people, and with 170 bubble jets you can be sure everybody is going to enjoy themselves. The water can be heated up to 104°F, and the heating system is very easy to adjust. Maintenance is simple, and filters are easy to replace. As for accessories, it comes with an insulated hot tub cover, a lock and a nice and practical carry bag among other things. Add the excellent price to the mix, and you get one of the best Intex inflatable hot tubs available right now. Here we have an Intex pure spa with a slightly different design than the previous one. It’s also made for six people, and has a capacity of 290 gallons of water. Compared to the previous one which was blue, this one is light brown which may be more suitable to blend in your surroundings. The outer diameter measures 85 inches, which is good to know when planning space. You will get a cover with a lock, a carry bag and a chlorine dispenser in the package. There is also a hard water system installed to prevent hot tub scaling and increase the longevity of the product. As for functionality, it also has numerous bubble jets to raise your relaxation to a new level. If the previous hot tubs we talked about are too large for you, this top rated Intex inflatable hot tub may be just what you’re looking for. It’s more budget friendly than the larger versions too and it’s ready for water in under 20 minutes. These things make it obvious why it’s one of their best selling products. The outer diameter of this hot tub is 75 inches, and it can hold 210 gallons of water. It’s made from the same Fiber-tech construction as the other ones, so you can count on it to be stable and retain the temperature. You control the heat and jets easily by using the control panel. In terms of space saving, this is probably the best Intex hot tub you’ll be able to find. Here we have another larger hot tub to give your whole family comfort and relaxation. It’s also made for 6 people, and has the capacity of 290 gallons. The outer diameter is 85 inches and it weighs about 98lbs when empty. It comes in a dark-brown color which blends in nicely on wooden patios for example. Like others, it features easily replaceable filter cartridges, a user-friendly control panel, hard water system and an abundance of accessories. You can control the power of 140 bubble jets, and set the temperature anywhere between 68 and 104°F. The build quality of this product definitely makes it worth looking into. Finally, we have one more compact product, to give you an alternative to the previous 4-person hot tub we talked about. It’s also packed with useful features and accessories such as a control panel, 120 bubble jets, replaceable filters, grab handles, insulated floor and cover, a security lock and a storage bag among other things. 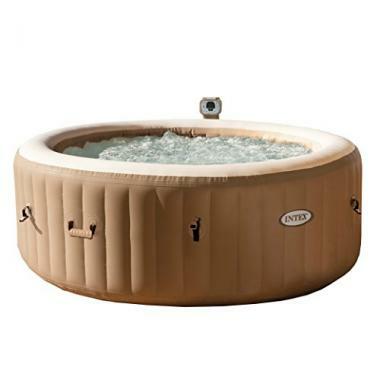 At 77 inches, the diameter is smaller compared to most hot tubs, which can be a plus. It’s very energy efficient and the installation instructions are very clear. If you made a decision to get an Intex inflatable spa, you can be sure you’re on the right path. Many of their products share certain features, materials used, design solutions and accessories that come with the product. The package will be equipped with everything you need to start using your hot tub right away. However, there are some differences between products, and it’s certainly good to be informed on what to look for so you can fully enjoy it later on. 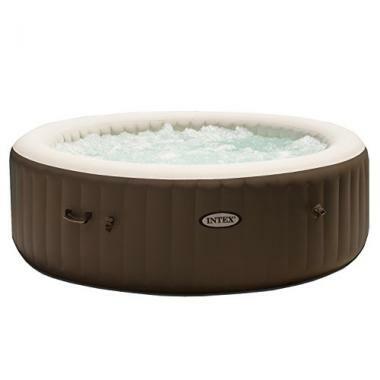 Like most inflatable hot tubs, Intex products are really easy to set up. As long as you follow instructions, you shouldn’t have any problems putting up your new hot tub. Intex provides you with a well-written instruction manual and often a DVD with videos, to make sure you don’t miss a step. All products come with an integrated air pump, and how quickly it’s inflated depends on the size (usually less than 30 minutes). Make sure you place it on a flat and level surface before beginning. Then you fill it up with water, plug it in a power outlet and turn the heater on. How fast it reaches the desired temperature depends on the heater power, amount of water as well as outside temperature, but on average it’s 1-2°F per hour. If you need help, be sure to check out our guide to setting up an inflatable hot tub. 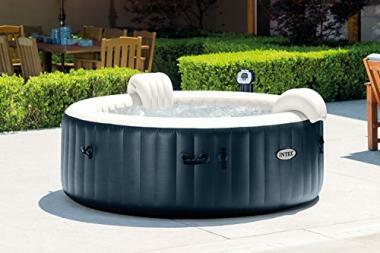 In our Intex hot tub reviews, we discussed hot tubs designed for 4 or 6 people. In fact, most hot tubs fall in these two categories, because they offer the best balance between comfort and practicality. Of course, you’ll be able to find tubs with larger or smaller capacities too. The most important thing to think about is comfort – you don’t want to be crammed up next to the person you’re sharing the tub with. So, it’s a good idea to get a 4-person tub even if there are only going to be two people using it. On the other hand, a larger product means you need to invest more time in hot tub maintenance. Luckily, Intex hot tubs are very easy to maintain – filters are easy to take out, clean or replace; all the surfaces are easy to clean and the whole system is reliable. However, this doesn’t mean you are allowed to neglect your hot tub – proper maintenance will prolong its lifespan and increase your enjoyment. Intex portable hot tubs come with many accessories, for example a cover, locks and chlorination devices to name a few. These accessories make the hot tub easier and safer to use. When we say safer we mean an increase in health benefits. All hot tubs are good for your body – stress is eliminated, muscles relaxed, circulation improved and your skin benefits too. In addition, hot tub chemicals (chlorine for example) are used to sanitize water and decrease the number of microorganisms. Furthermore, a cover with locks prevents anything from falling in (or unwanted guests using the hot tub), that way keeping the water safe to use for a longer time. This is closely related to capacity, but you need to look from a different angle here. The size of your new Intex spa is limited by the space you have available. You may decide to put it on your porch, in the backyard or in your living room and not all products are going to fit. Always carefully plan where to put a hot tub, and then check the dimensions provided by the manufacturer. The shape of your new hot tub isn’t all that important in regard to functionality. However, a square tub can save some space if you plan to put it in a corner. 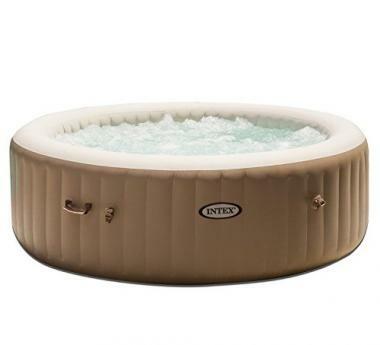 Most of Intex products are round, but a number of Intex octagon hot tubs are available too. Jets have a huge impact on your enjoyment. Intex tubs come with powerful bubble jets, usually spread around throughout the tub. User experiences are very positive, so you can expect a delightful massage. However, not all products we listed come with the same number of jets, so be sure to check this before buying. Like we said earlier, these products are packed with features. You get pumps, filters, a heater, easy-to-use controls and, as an additional plus, a hard water system. All this contributes to an excellent user experience. Furthermore, Intex gives a warranty on their products too, usually one year. Hot tub care is generally very easy with this type of tub – easier than with regular ones. Filters do most of the hard work – they are very efficient and collect all the dirt. Make sure to check and clean them regularly, and to add the necessary chemicals when needed. You can have additional peace of mind if you test hot tub water from time to time. Q: Why Choose Intex Hot Tub Over Other Hot Tubs? A: You should choose Intex because of the pure quality their products give you – they are well made, with excellent stability and great durability. The construction doesn’t deform under the weight of water, and the body is very resistant to punctures and damage so you can count on it to last longer than many other products in this category. A: There are several reasons to do this. 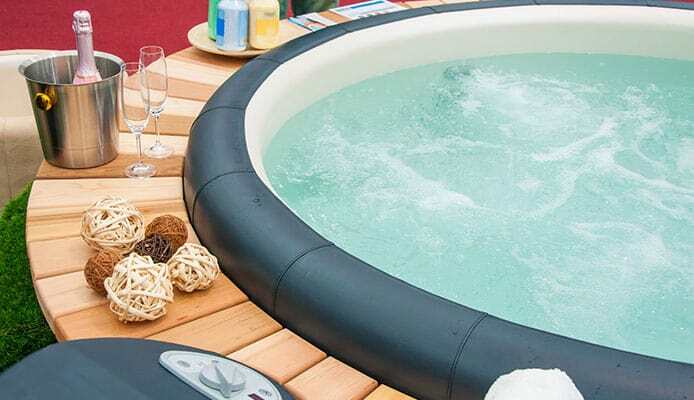 Inflatable hot tubs are very quick and easy to put up. In addition, they are portable – you drain, deflate and pack them and take the tub anywhere you want. Finally, there is a significant difference in cost compared to a standard tub – an inflatable tub is going to save you a lot of money. Q: Can I Set Up My Intex Hot Tub On My Own Or Do I Need A Professional To Do That For Me? A: Yes, you can easily do it on your own, without any professional help. You will get detailed instructions, and as long as you stick to them, you won’t have any problems getting your hot tub ready very quickly. Q: What Other Accessories Will I Need For My Intex Hot Tub? A: Like we said, one of many upsides of Intex products is that they come with everything you need to get started, so it’s ok if you don’t want to buy anything else right away. However, if you want to improve your experience, you can get some hot tub steps, or go through best hot tub accessories we have prepared for you. Inflatable hot tubs are an excellent choice when arranging a home spa, and Intex tubs should certainly be on top of that list. We are delighted with their products and have said many praises on their account. There are many happy users to back us up. We recommend you try one of the best Intex inflatable hot tubs, and see for yourself, you won’t be disappointed! 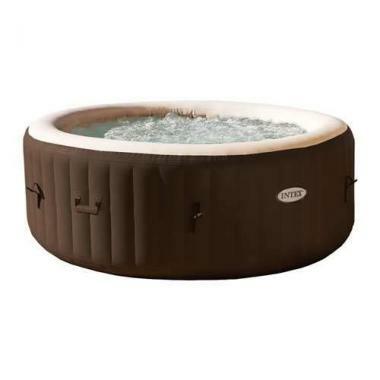 Have you tried an Intex hot tub that made it onto our list? How are you satisfied with the quality? Was it easy to set up and use? Please share your experience with us in the comment section below.